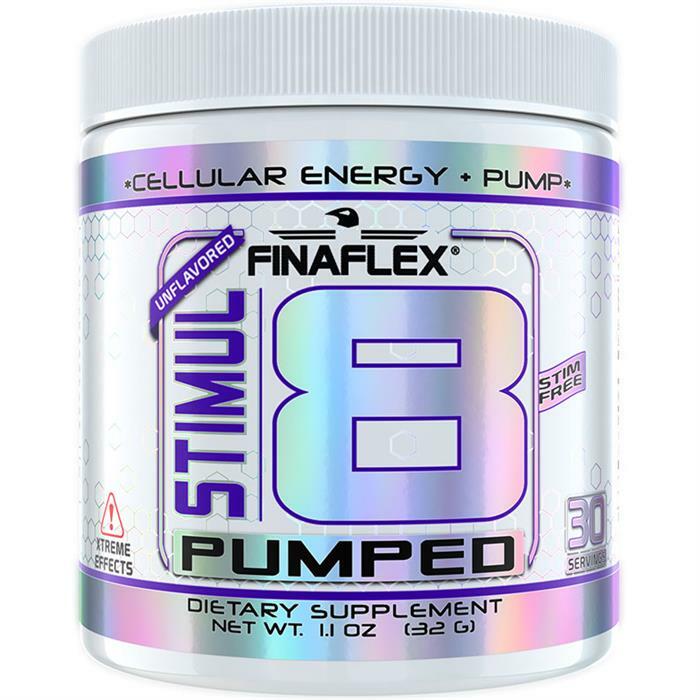 STIMUL8® PUMPED™ is built with ingredients designed to promote increased cellular energy and muscle pumps. 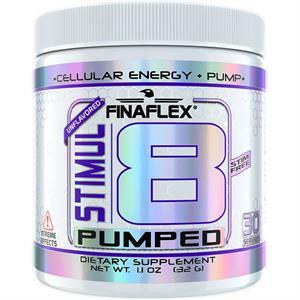 Powered by three robust ingredients, FINAFLEX® STIMUL8® PUMPED™ provides added energy to destroy workouts and achieve the sought after muscular "PUMP" you have been searching for. * These statements have not been evaluated by the Food and Drug Administration. This product is not intended to diagnose, treat, cure or prevent any disease. 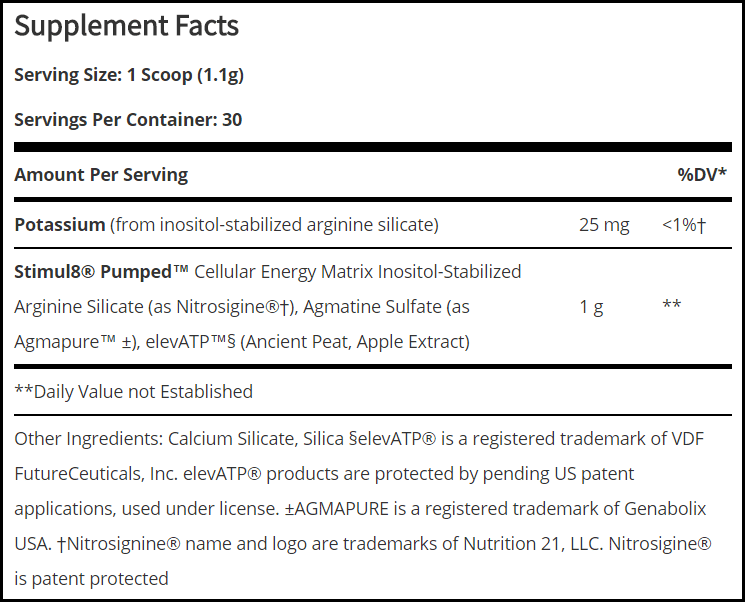 Recommended Use: As a dietary supplement, mix 1 scoop of STIMUL8® PUMPED™ with 8-16 ounces of your favorite flavored beverage or Pre-Workout Supplement, 15 minutes prior to exercise, consuming immediately upon mixing. WARNING: KEEP OUT OF REACH OF CHILDREN. DO NOT USE IF PREGNANT OR NURSING. Consult your doctor prior to use if you have or are at risk for prostate disease, heart disease, or any other general medical condition. 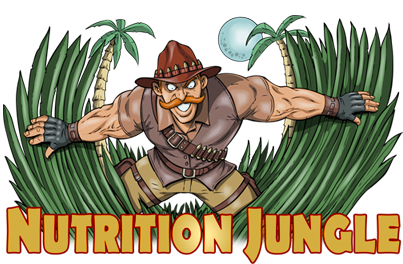 All persons are advised to consult with their doctor or other medical authority before use of this or any other dietary supplement. Discuss possible interactions and contradictions of this dietary supplement with other medicines currently prescribed by your doctor. Discontinue use immediately if you experience any adverse symptoms or reactions while taking this product. Discontinue use 2 weeks prior to surgery. Do not use if your health status is unknown. May not be suitable for persons under the age of 18 years old. Do not use for more than 8 weeks consecutively. Contents may settle in transit. Shake container prior to use to redistribute ingredients. Store in a cool dry place (heat and humidity can cause clumping). Do not discard desiccant after opening.